← Can seed lists measure email deliverability? A practical guide by the numbers. [Tool] Bypassing image suppression in emails: Mozify! As you can see, the recipient already gets an appealing look on the newsletter without the need to open it (in the sense of loading graphics). 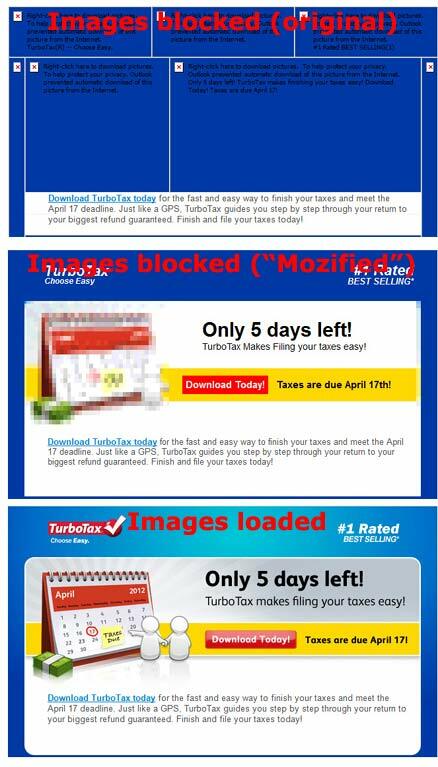 Image blocking usually affects about 50% or your subscribers. They won’t see any graphics that might help to grab their attention or raise interest. Now, it’s “tricked”. convert any image to an HTML mosaic or to formatted HTML text. [T]he Outrigger yielded a 376% increase in total click throughs! […] On the day after Memorial Day weekend 2012, USO.org sent a “mozified” email and saw a 36% increase in total donations raised! […]On a straight 50/50 A/B test to 60,000 recipients, Fairfax saw a 110% increase in total click throughs in areas that we optimized. Kudos to Email on Acid for driving email innovation. This entry was posted in english and tagged imageblocking, images, Tools. Bookmark the permalink. 12 Responses to [Tool] Bypassing image suppression in emails: Mozify! Thanks for the spotlight and the kind words Rene! .. you’re welcome – Mozify looks really promising! RT @stylecampaign: Kudos to EmailonAcid for Mozify http://t.co/OJZ2AIqM v @lukeanker – Thanks Anna! This looks pretty cool. I’m going to have to try this. This is just a cheap trick to circumvent the customer’s preferences. If someone doesn’t want to see images, we shouldn’t be showing them any, blocky or otherwise. I can see the appeal for spammers but not for respectable companies.